Alder Cones are the fruiting body of the Alder Tree Alnus glutinosa .These trees are common throughout Europe, Asia and parts of Africa and love to have their toes in water this is why it is common to see Alder trees on a river bank or by a lake. These trees are also pretty common in northern parts of America after being introduced as a ornamental plant, nowadays it is probably considered invasive. Foliage The leaves are simple, alternate and doubly-toothed. (Leaves can be used when dried? In the fall once the Alder Tree starts to lose its leaves the Alder cones start to brown and this is when the Alder Cones are good for picking and this is when they will have the most tannin's as winter and any rains will wash them out. Fast forward to the spring and the warm sun will open these cones up again to release there seeds, you can simulate this by placing them in a warm place in your house. 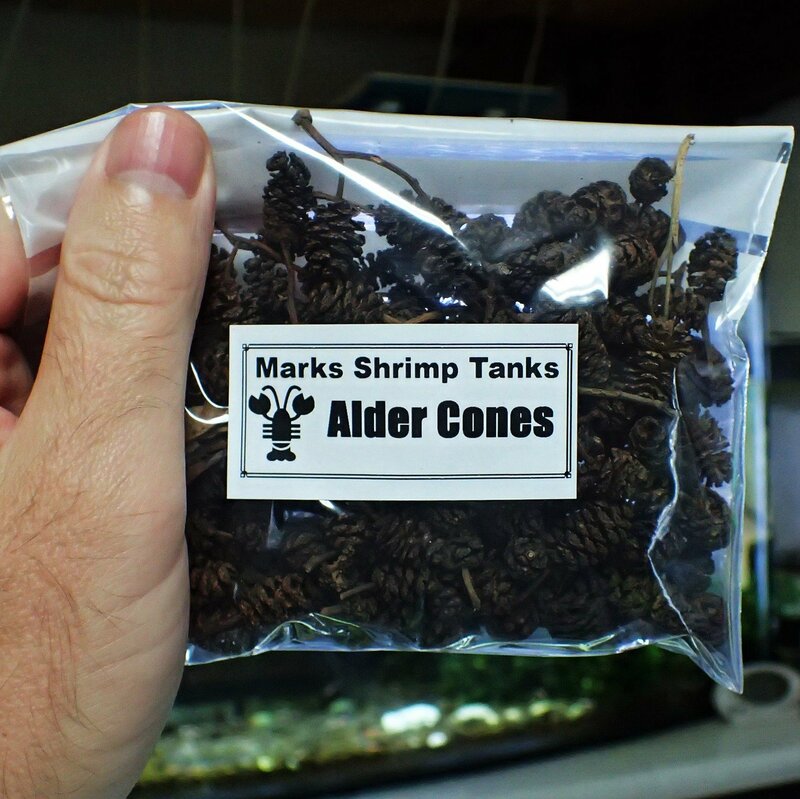 Alder Cones release tannin's which we have mentioned and are beneficial to shrimp. Benefits of Alder Cones in the Shrimp Tank. They can also provide different types of bacteria and fungus ( Bio film) to the shrimp as a food source. The dose I like is 1-2 Alder cones per 10 Liters of water, if you get twigs with your Alder Cones put them in the tank also. You will never have to replace these Alder Cones as the Shrimp will eat them down to nothing through decay,as the wood is broken down by fungus and bacteria the shrimp consume them.